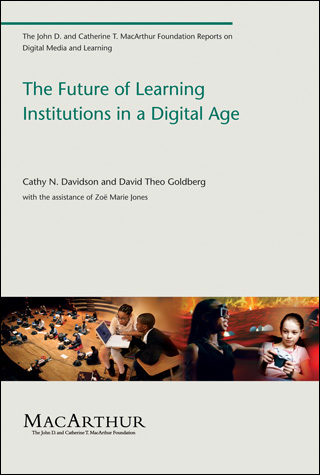 In their 2009 MIT book The Future of Learning Institutions in a Digital Age, Davidson and Goldberg put forward ten principles for how learning institutions will need to change in order to reflect the growth of importance in the internet and digital tools for media consumption and creation. These ten principles should underpin how we structure our places of learning over the coming years: the third space of learning is very much at the heart of what they explore in their short book, and is well worth reading. I outline these ten principles below, adding my own thoughts to them and linking them specifically into secondary, 11-18 education. Davison and Goldberg are writing from a higher education perspective so it is important to offer a few caveats: bringing browsers and iPads into our schools can be tremendously powerful, but we still have a role to ensure they are used productively, and not as tools for distraction. Self learning has changed from the traditional model of the simple online course. It is now ‘collaborative, interactive, non linear and relational, engaging multiple voices’ (p.26). When young people learn online they do not do it in a linear fashion, moving from one page to the next or one lesson to the next. Their way of learning is more intuitive; they are prepared to move off on tangents when they are learning online. However, this is not without its problems: we have all asked students to do online research and found that they have soon wandered off task. This ‘productive if complex and challenging’ switchboard is something we need to direct them in, giving them parameters within which to work and ensuring that the tasks we set them are measurable and achievable. Open ended tasks have their place, but we need to guard against offering students too much flexibility, particularly younger students. We need to move away from the ‘top down, standardized’ structures of learning towards a more collaborative, team-based approach to learning. Learning strategies need to shift ‘from a focus on information as such to judgement concerning reliable information, from memorizing information to finding reliable sources’ (p.27). However, we must not move away from seeing ourselves as role models, as those who inspire and create the safe spaces in which students can learn collaboratively. It is not enough to hand out the iPads, take a step back and say ‘get on with it’: now more than ever our role has to be as one who sets the tone for learning in all the spaces young people inhabit: it is not only about good classroom protocol, but good forum or chat room protocols, or knowing what information to trust and what to avoid. We need to focus our attention on issues of ‘credibility’ rather than those of ‘authoritativeness’. ‘A major part of the future of learning is in developing methods, often communal, for distinguishing good knowledge sources from those that are questionable’ (p.27). We need to teach our students to make ‘wise choices’, which means of course that we have to learn how to make those choices ourselves. We need to ensure that we are masters of these digital spaces, spending our planning time researching those collaborative tools (like Pinterest, Twitter and Flipboard) that enable students to access resources quickly and effectively, as well as learning themselves the conduits through which quality digital content can be both curated and disseminated. Along with this comes the notion of trust: ‘If older, more traditional learning environments were about trusting knowledge authorities or certified experts, that model can no longer withstand the growing complexities’ of modern ‘knowledge domains’ (p.28). There are big issues at stake here, in our role as traditional ‘holder of knowledge’. If we are now saying that our students can find the information they need on line, why do they need us? My answer to this is simple, and it links back to this notion of trust: young people learn when they trust. The human relationships we have with those we teach are irreplaceable: when we get it right the learning flourishes. When we get it wrong, and the climate is one of distrust and fear, then learning simply cannot happen. One only needs to look to Maslow to know this. But can we not begin to foster these trusting relationships through secure online learning communities, moving these relationships up into the third space of learning? We have a fear of this, borne of the rise in the grooming of young people on line. It is therefore our responsibility to create safe spaces where these relationships can continue to grow and trust can continue to develop without the direct face to face interactions of the physical, first spaces of the classroom. Sites like Wikipedia enable us to leverage the power of crowdsourcing in ways we have never been able to in the past. However, some schools and colleges frown on sources like Wikipedia. As Davidson and Goldberg suggest, ‘this is a catastrophically anti-intellectual reaction’: we need to acknowledge the ‘importance of a collaborative, knowledge making impulse in humans who are willing to contribute, correct, and collect information without remuneration: by definition, this is education’ (p.28, their italics). My writing this blog is an example of this: I am not writing it to earn money but rather because of my basic need to share my ideas and experiences so that others might add to the debate. The fact that the Kindle version of Davidson and Goldberg’s book was made free by the MacArthur Foundation is has enabled me to write this in the first place: this knowledge, by being made open source, has the potential to grow exponentially into the future. We are used to our networks of teaching and learning in the first and second spaces of learning. We speak, listen, take turns, argue, debate and so on. However, as soon as we move the artefacts of our learning into the third space, we can begin to open them up to correction, as well as being able to correct and add to the work of others. Examples of this include the ability to comment on blogs, or to work on a Google Doc either synchronously or asynchronously. Sites like Conceptboard enable us to upload documents which can be worked on together in real time or at different times. Learning in the third space can happen whether we are all together or are working at different times in different time zones: it is not limited to the here and now. By opening up our learning to the world we need to be able to teach students to be both the discerning creators and editors of online content. By both producing content and being able to critique the content of others, we can blur the boundary between teacher and student, creating communities of learner teachers and teacher learners, rather than one or the other. Networked learning ‘is predicated on and deeply interwoven into the fabric of open source culture’ (p.30). This culture’s aim is to open up the creation and consumption of knowledge, to share freely the production of resources, and to be open to the continual improvement of these resources through the input of users across the world. It is about opening up the ownership of texts and moving away from intellectual copyright and the physical library as the sealed up repository of knowledge. However, along with this we have a duty to teach the protocols that work alongside open source learning, the most important of these being intellectual honesty. Plagiarism has become a real problem, and not only with our students. If the head of the IB is caught doing, it, there is an urgent need to ensure that we teach students how to honestly use these sources: however open they are, they must not use them dishonestly. They say that a problem shared is a problem halved: this is no more clear than in the intensely networked third space of learning. ‘Challenges are not simply individually faced frustrations… but mutually shared, to be redefined, solved, resolved, or worked around – together.’ (p.32). Using social networking educational platforms like Edmodo mean that students no longer need to feel isolated when working through problems at home: they can interface with their teacher or their entire class, thus leveraging help as and when they need it. In addition, the proliferation of material on sites like YouTube and iTunes U means that advice is always close to hand. When I think back to my time revising for my Maths exam, having been appalling badly taught for 2 years, I had only a Letts revision book to work through. I could now go to Khan Academy and learn everything I need to pass my exam, alongside forums where I can post my concerns and receive a dozen useful replies. Times have certainly changed! We are all now lifelong learners, more so than at any time in the past. We have to be: things are changing fast and we have to keep up. As teachers, we have a duty to ensure that we stay abreast of the latest advances, whilst all the while keeping one eye on what works in the classroom. We need to instil this love of learning in those we teach: by showing them the vast potential of the internet and the benefits of networked learning, they will hopefully see the benefits of this beyond their schooling. This blurring of the boundaries between the spaces of learning can extend into their adulthood, making them, like us, truly lifelong learners. By moving learning up into these new spaces, we need to rethink the role of the learning institution itself. ‘Traditionally, institutions have been thought about in terms of rules, regulations, norms governing interactivity, production and distribution within the institutional structure (p.33). These new mobilising networks stress ‘flexibility, interactivity and outcome’. Whilst being bound to an educational system which promotes a one size fits all exam structure (which Gove seems intent on making even more so with the mooting of an Ebac for all), we need to work where possible to open up the places where we and others learn, seeing them as places of enquiry and debate rather than rigid places of factory learning, where students do one lesson after another without any sense of cohesion or continuity. However, alongside this lies the need to ensure that our young people, who often come from homes where there is little structure and few boundaries, have spaces in which to learn where they feel safe and where there are clear boundaries for expected behaviour. It is not enough simply to open up our schools into plazas and remove direct teaching in favour of project based learning. There is a place for the breakout area and a place also for students working through real world problems collaboratively. I do firmly believe, however, that a complete move away from our current paradigm can be enormously damaging to both student and teacher: just look at what has happened in some of the BSF schools that simply did not prepare for their multi million pound plaza-style schools. We have to align our pedagogy with students’ needs, and use the different spaces in ways beneficial to all. Mobilising is as much about working with our students to ensure we all know the rules of engagement as it is loosening the spatial and temporal boundaries in the learning day. We are no longer bound by the 30 to 1 classroom: now, both teacher and student can reach out to a truly world wide web of learning interactions and possibilities. We can test our ideas and hypotheses in a safe environment, run simulations that can include small groups or groups across the world. The classroom has become truly flat: we need to embrace this rather than seeing it as a threat. Our students already fully inhabit these flexible third spaces of learning, are networked and are well used to collaborating with others in determining their own identities. They do not see an audience of millions as off-putting in the way we might have done: it is a natural extension of their physical existence. In their book, Davidson and Goldberg have only begun the debate, outlining what we need as a society to address if we are to truly blend the different spaces of learning into a meaningful whole. We are on the cusp of a paradigm shift but we are not there yet. We must not run before we can walk: let’s use what we know and keep sharing, as through the constant dialogue we can develop ways of teaching and learning that move us from where we are, to where we need to be. Next Post The best way to disseminate screencasts?